Cats and dogs are fighting. Again. Wait, perhaps ‘still’ is more accurate? They never seem to get along for some reason, and yet, something tells me they’ll have to, in Cat Quest II. While the nations of Felingard (cats) and the Lupus Empire (dogs) are locked in heated battle, the two kings… are on a mission to reclaim their thrones. Which requires teamwork. Until it doesn’t. Or some such. Bear with me, please – much fur to sift through here. Now, don’t let its cutesy looks fool you: Cat Quest II, much like the original, involves plenty kicking of a certain body part, being an action RPG and all. Likely loads of cat and dog jokes too, which is purfectly fine by meow. We won’t be limited to one or the other on this quest either, players seemingly able to control both royal creatures as a single unit, biting, scratching, flinging fireballs and making stuff go kaboom – whatever the situation calls for. Love it. Following the success of the acclaimed CAT QUEST, developers The Gentlebros return to the world of Felingard to expand on the original with more explosive spells, expanded weapon options, an exciting new character switch mechanic, and local co-op! Alternatively, you could hand control of either over to a friend (albeit sadly, only locally); provided you can agree on who’ll play which part of course, as based on the trailer below, there can be only one… of each species. Once that’s taken care of, a grand journey awaits, one of exploration, more combat than you can shake a paw at, dungeon delving, and of course, quests. Ah yes, the quest. So many quests, each of which helps build the world around you. In other words: a pawsome adventure awaits! 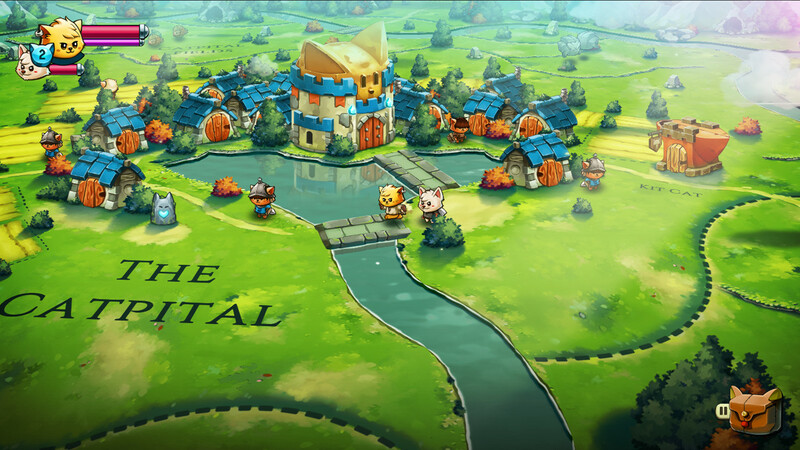 Cat Quest II will be on Steam, Switch, PlayStation 4, Xbox One, Android, and iOS, in 2019.